Skavsta Airport was established in 1941 as the 11th airbase (F11) and discontinued in 1980. The airport begun civil operations in 1984 through the municipality, but since 1991 it has been called Stockholm-Skavsta Airport. The current owner is Airports Worldwide Inc. The airport has intersecting runways 16/34 (2,039m) and 08/26 (2,880m). ILS and NDB for rwy 26 and LOC NDB for rwy 08. Runway 16/34 is mainly used by the flying club and smaller planes due to environmental restrictions. The Swedish Coast Guard and Målflyg (Target flights) are based here. 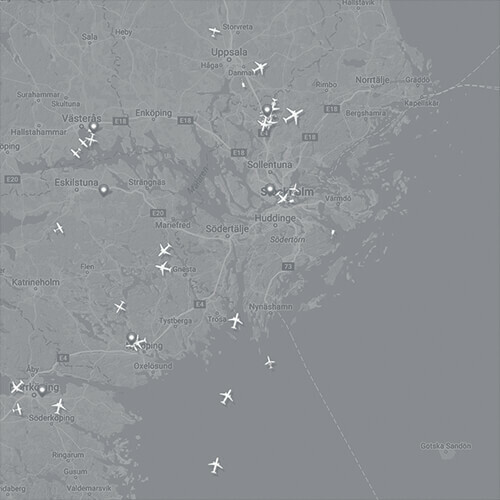 Ryanair – the largest customer – have a base here and constitute most of the scheduled movements. Wizzair has scheduled traffic mainly to Poland and Eastern Europe. Nordflyg (freight/postal flights) is also found at Skavsta and they operate a maintenance business here. The airport also hosts a flying club and a skydiving club with activity during the summer. Private jets land occasionally, and Skavsta is also a popular destination for the flight training schools in Västerås. FFK (The voluntary air force) also has a base here.